Navigating Burnout – arts, ink. Photo by Julia Rose Lawson. I am a junior now, still pursuing viola performance. Sometimes, I feel so immersed in music, that it doesn’t feel like music to me anymore. It’s analyzed, fragmented, repetitive, robotic. It’s causing me anxiety when I work on anything else. 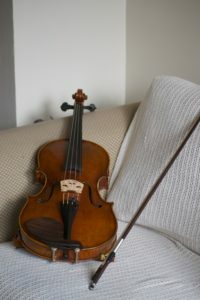 I have spent almost eight years with this viola on my shoulder– my longest relationship. I love it because it has taken me everywhere that I have needed to go in my life. Without it I would not have met my closest friends and because of that, I would not be myself. I wouldn’t be here, in Michigan. And maybe it’s cheesy to say, but I feel connected to it. In my heart. How could I not? Eight years and thousands of hours. It is my part of my body and it is my voice. But I have done so much. It is so integral to my identity that I don’t know who I am without it, and that’s not necessarily a good thing. Lately, practicing has become more mundane and I constantly question myself about what I really want. I know classical music isn’t my path anymore. I have to stick with this degree because the training is good and I care about being a good violist, but I also have to start challenging myself again. It’s dangerous to pursue an art if you don’t love it. And I know that deep down I love it, but it’s been a really long time since I’ve felt genuinely passionate about something. The truth is that my ideas about what music is are changing. Since I’ve gotten to college, I have been more exposed to jazz, world music, roots music, and improvisation. Musical improvisation has been this big concept looming over my head as I question what it really means to be a musician. Improvisation requires you to make music in the moment, like a real-time composer. To be a good improviser is to have a musical mind, but what if I can’t improvise? If I can only play what’s printed on a piece of sheet music, do I have a musical mind? No, but I know I want to. Every musician wants to know music like that. If you know music like that, and you have the technical abilities to play whatever you want, your creative expression will be endless. And that’s what I really want: to be able to fully, freely, creatively express myself in a musical way.